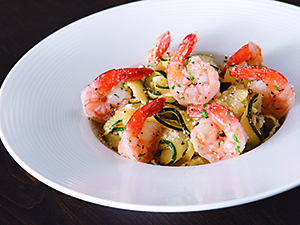 To lighten up the recipe, Brian Sullivan, senior vice president of culinary development for California Pizza Kitchen, slices fresh zucchini into thin ribbons that mimic fettuccine; they stand in for all but 20 percent of the pasta. Layering aromatics and herbs in a wine sauce pumps up flavor without the additional fat and calories from cream. Heat oil in sauté pan. Add shrimp and sauté until pink. Remove and set aside. Add garlic to pan; sauté 1 min. Stir in wine and butter; bring to a simmer. Add zucchini and salt-pepper blend; steam until al dente. Return shrimp to pan to heat through. Add cooked fettuccine; toss to combine. Add 1/8 cup Parmesan; toss again. For service, transfer to plate and sprinkle remaining 1/2 tbsp. Parmesan on top.